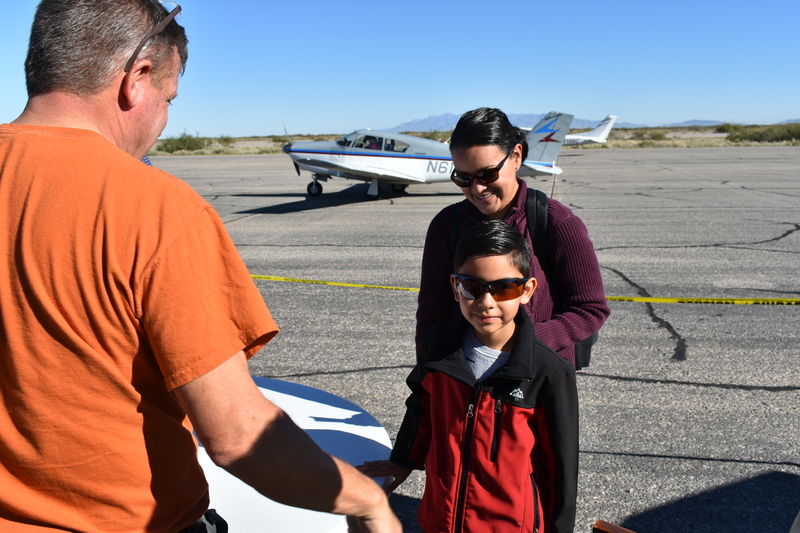 This past weekend, once again, EAA Chapter 1570, at the Dona Ana County International Jetport, produced its 5th successful Young Eagles event, an activity in which the Chapter members (most of them are also FASF members) gave free introductory airplane rides to children between the ages of 8 and 17. All aircraft used belong to the chapter’s members. 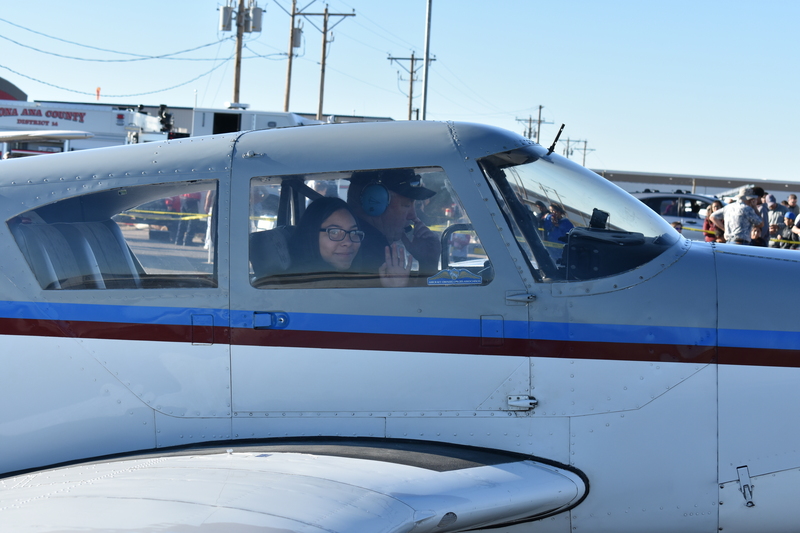 The project’s Chairperson, once again, was Rotary and Fixed Wing Flight Instructor, Deb Rothchild. Here, below, are some photos to show the popular youth education program in action. Remember: If you’d like to view any of the below photos in full high resolution, simply click on them. Then, if you’d like, please feel free to download or copy them for you own use. 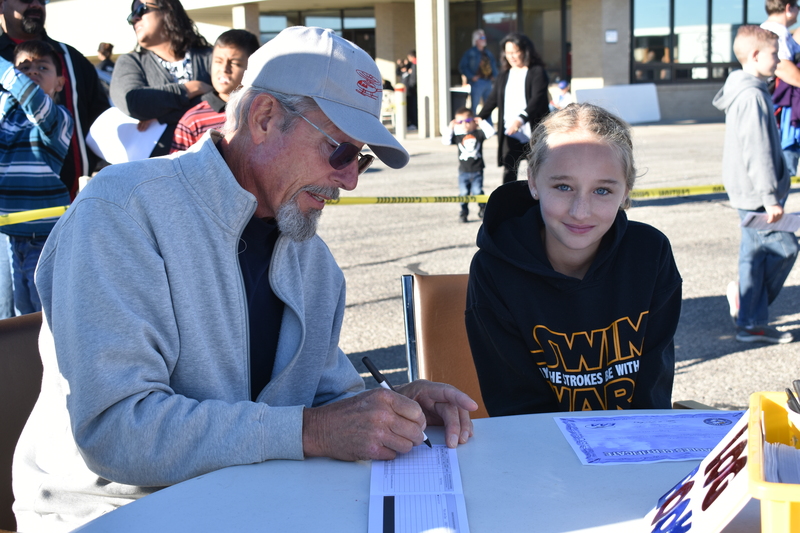 Above, Melissa Keithly, wife of the chapter’s President, John Keithly, and one of event’s principal organizers, with back to camera, greets, and begins to sign up first arrival parents and their children who want to get their Young Eagles Flight . . . 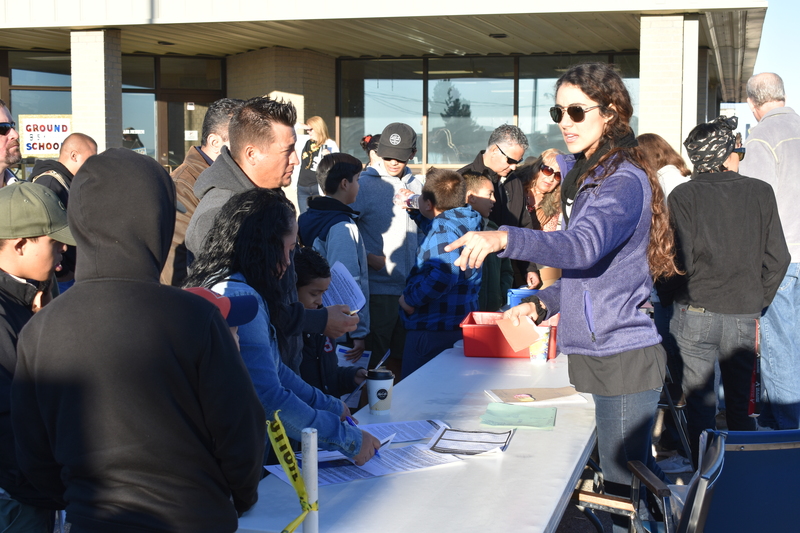 Helicopter pilot, Priscilla Porras, (pointing to her left) gives instructions to those signing up for their first flights . 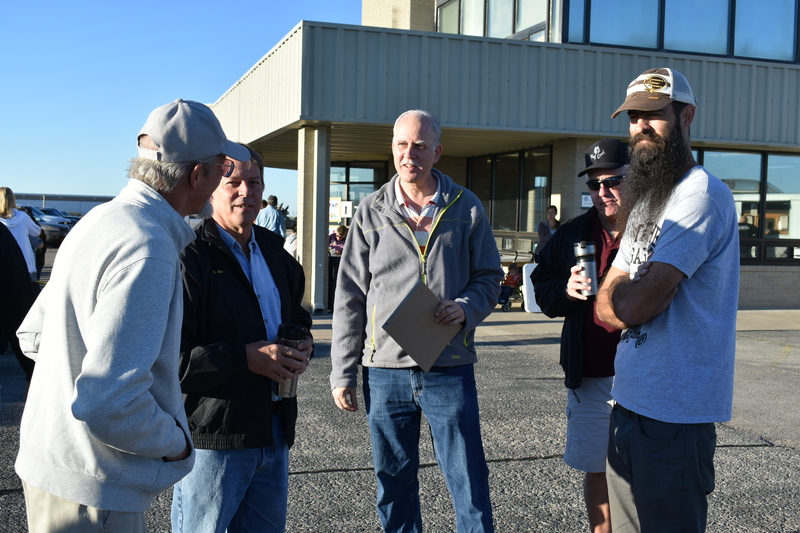 . .
A group of the volunteer pilots for the day talk over the coming flights – L to R: John Keithly (Chapter President), Mike Robinson, Jim Foster, Danny Carter, and Bryce Daniels. 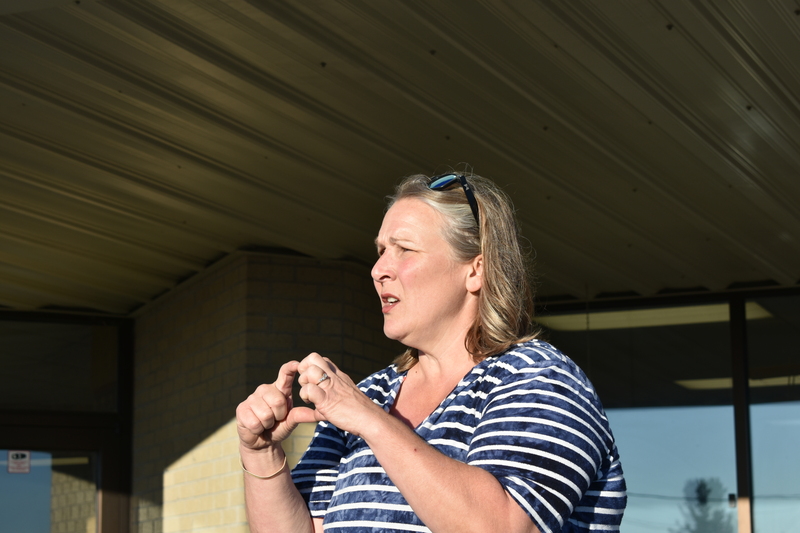 Chairperson of the entire event, Professional Flight Instructor, Deb Rothchild, explains to the crowd the procedures and safety precautions . . .
War Eagles Air Museum’s (WEAM) Executive Director, Bob Dockendorf, looks on as project gets underway. 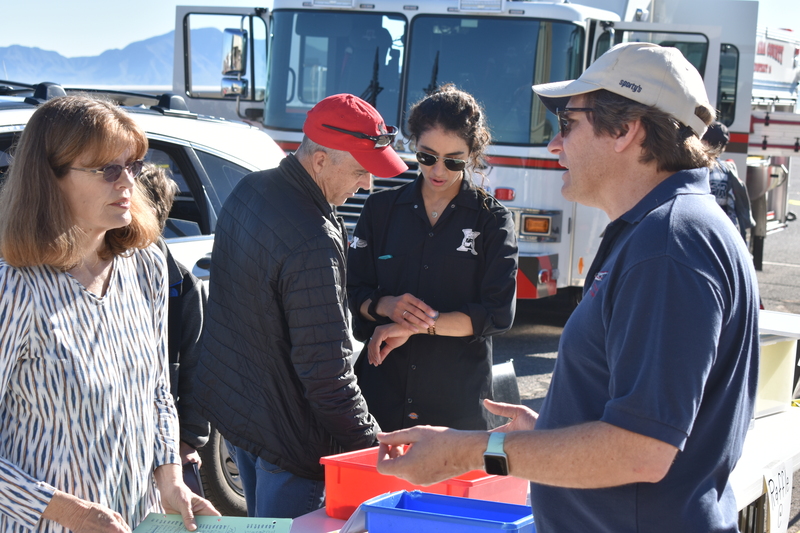 Bob has been an active leader in the EAA Chapter 1570 since its earliest days and the Museum he directs is an integreal part of the Chapter’s success. 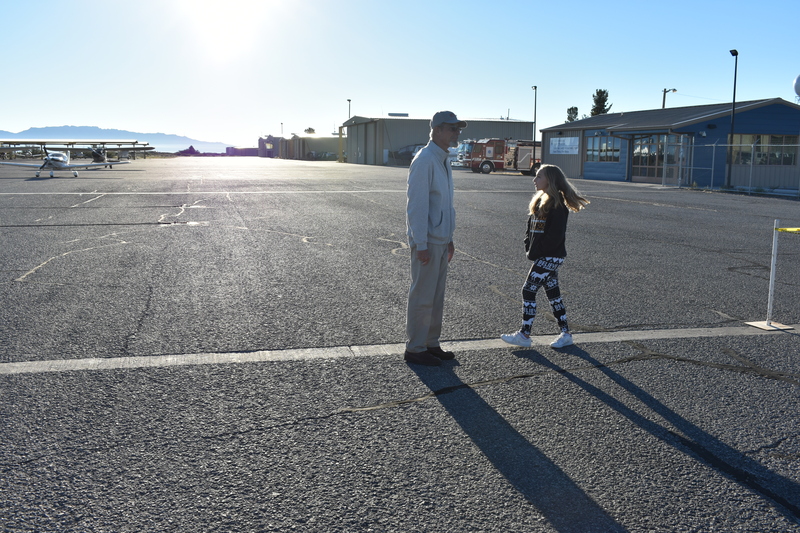 Chapter President, John Keithly greets his next Young Eagle for her flight. 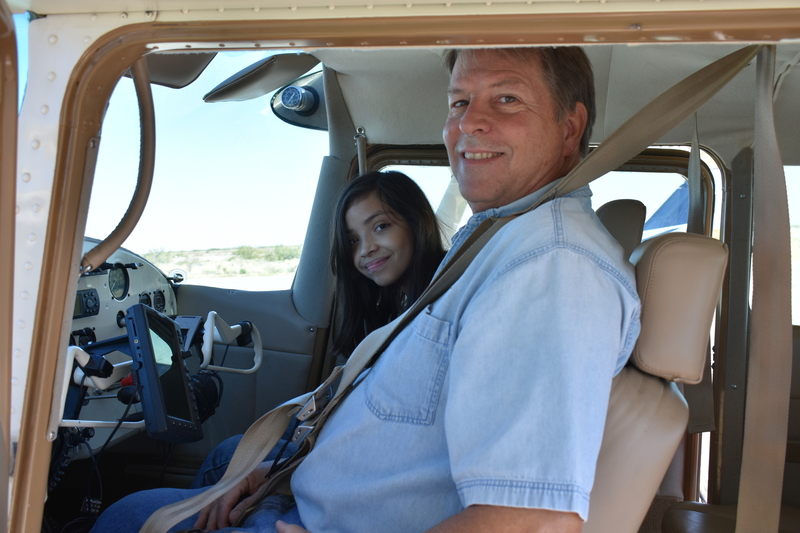 Pilot John Signorino, El Paso business entreprenuer and Chapter Vice President, walks his Young Eagle to her first airplane flight in a Cessna Skylane. 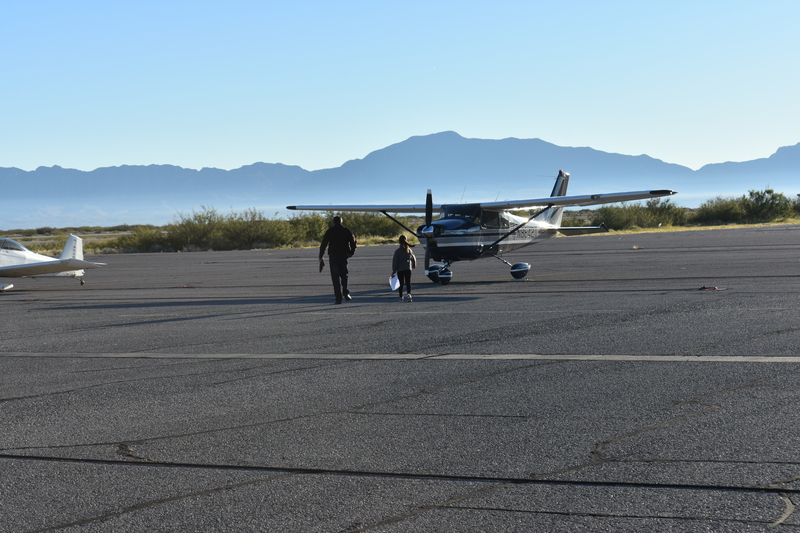 Chapter Pilot, Dave Daniels, escorts his Young Eagle out to his plane, a vintage Piper Super Cub . . . 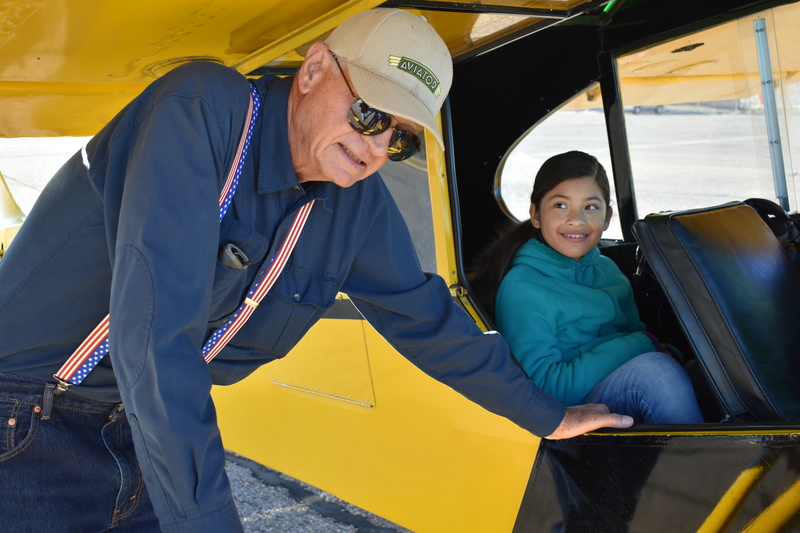 Pilot John Signorino, a former Army Air Services Pilot, helps his Young Eagle get belted in for her first adventure aloft. 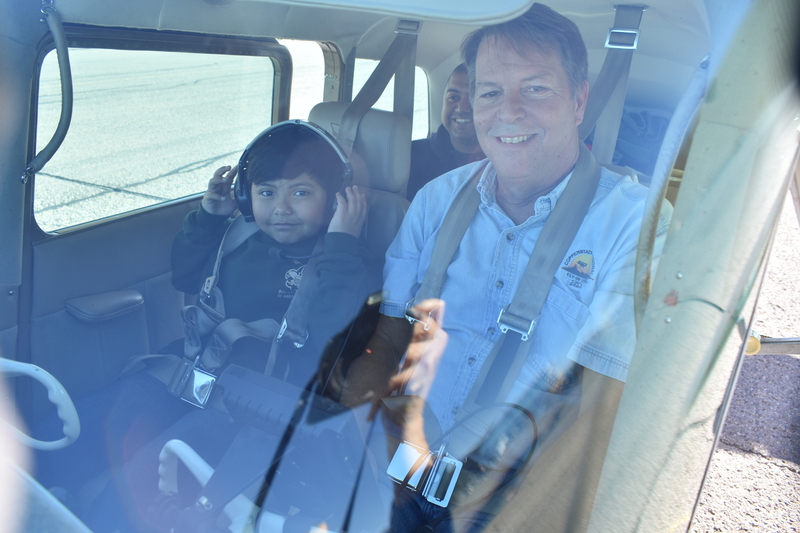 Pilot Bryce Daniels, helps his Young Eagle adjust his seatbelt in readiness for his first flight. The plane is a Van’s RV 8 Experimental ship. 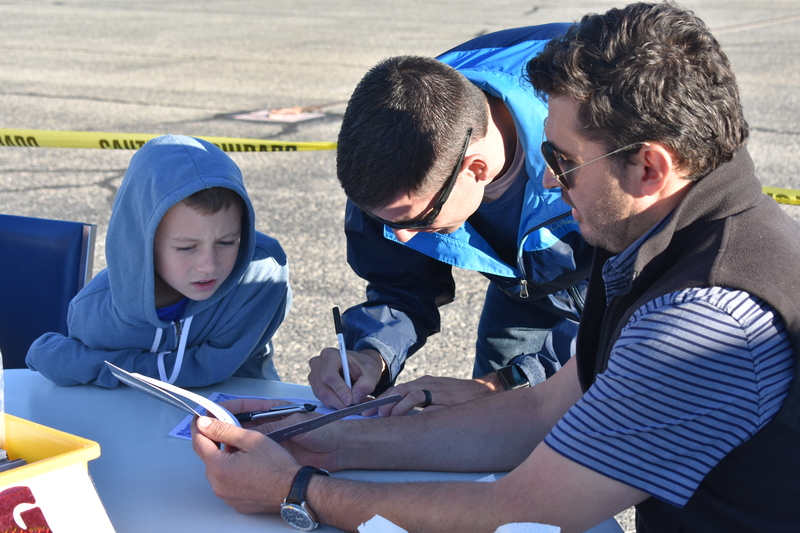 This Young Eagle gets his orientation before his flight from EAA Chapter 555 President, Wes Baker. His plane is a Classic 1948 Cessna 140, fully restored and in excellent ‘like-new’ condition. All General Aviation aircraft, regardless of age, must be fully inspected each year to assure that they fully meet established Federal Standards for their airworthiness. 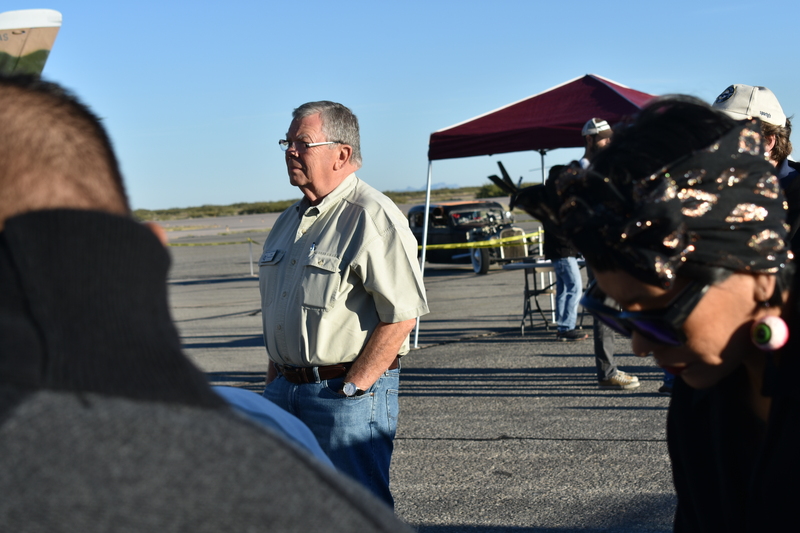 Chapter President, John Keithly, describes their pending flight to his Young Eagle in his Chzech built “Dynamic” composite airplane. 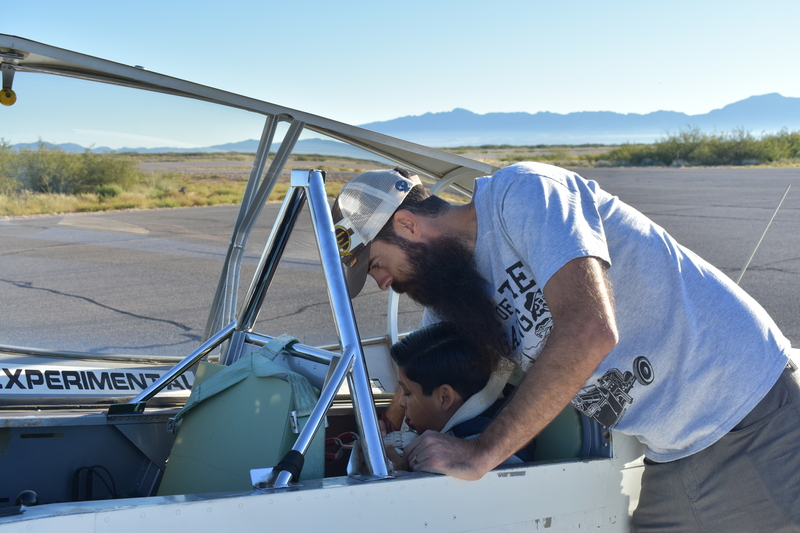 John and his wife, Melissa, just recently helped build their own new Van’s RV aircraft. 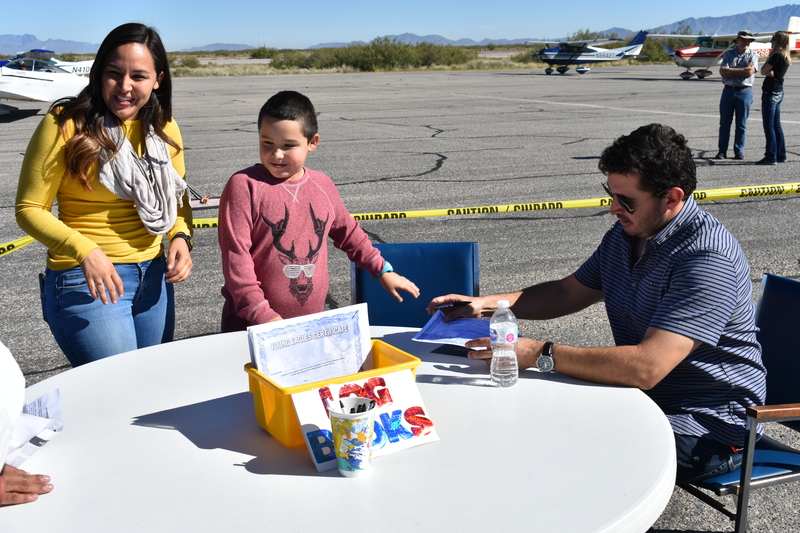 CEO and President of Red Arrow Flight Academy at the Dona Ana County Jetport, Tomas Peralta (R), explains how he has filled out his Young Eagle’s new Flight Log Book, while the young man’s father signs the Young Eagle Flight Certificate. 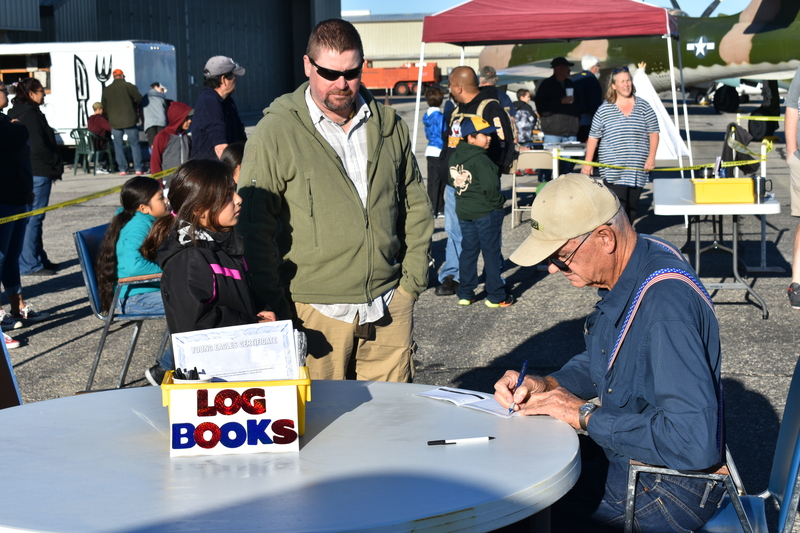 Chapter Pilot, Dave Daniels, completes his Young Eagle’s Flight Log Book as her father looks on. 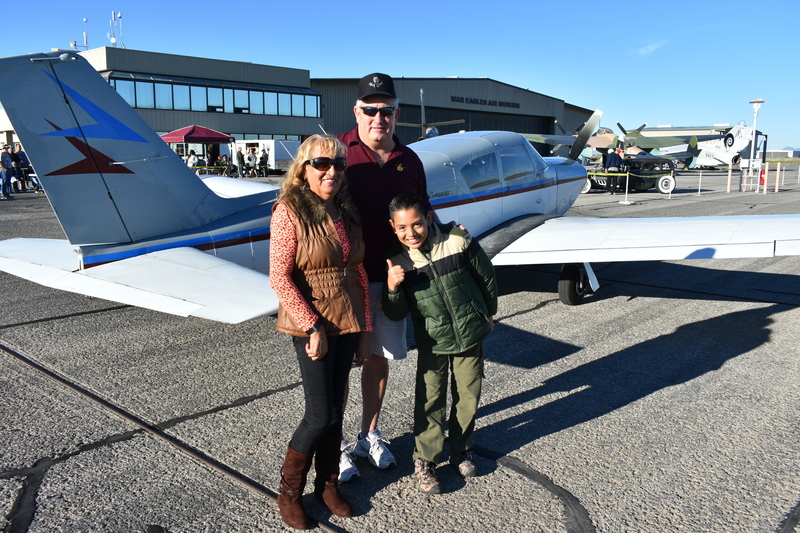 Chapter Pilot, Danny Carter, poses with his Young Eagle and his Mother, before they take off in his Piper Commanche aircraft. 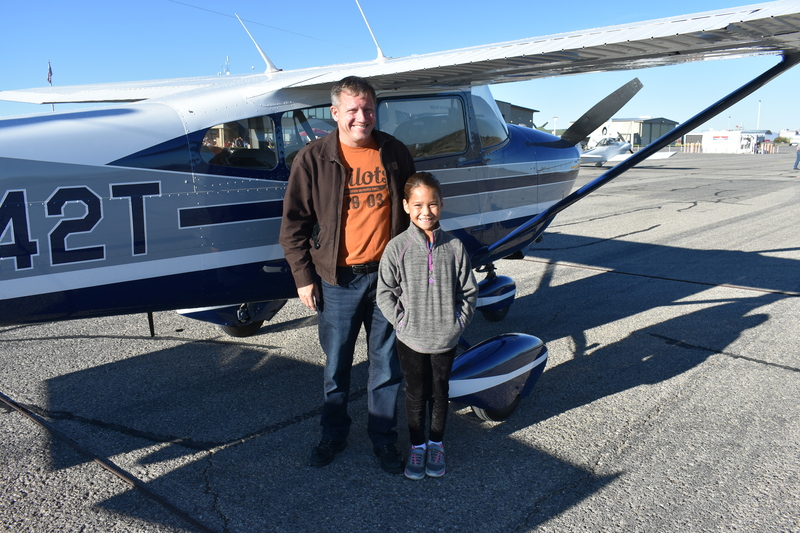 Pilot John Signorino and his Young Eagle pose before their flight in front of the Cessna 182 Skylane. 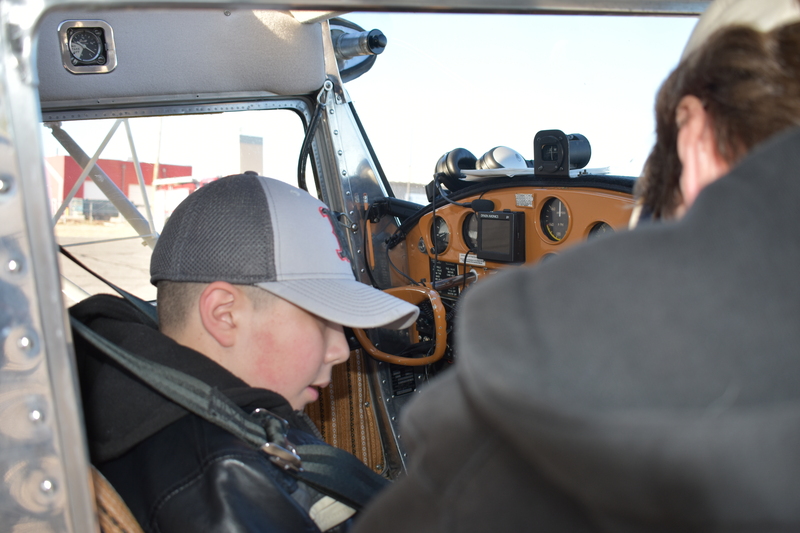 Pilot Dave Daniels, whose son, Bryce was also piloting the children in another aircraft, has just explained to this Young Eagle what they will do during her first flight in this vintage Piper PA-18 Super Cub. Pilot Danny Carter, announces his departure over the radio, and taxis out from the loading area with his Young Eagle, as she happily waves to the Chapter photographer. Pilot, Mike Robinson (R), in front of the Cessna 172 Skyhawk airplane in which he just flew this Young Eagle and his father. 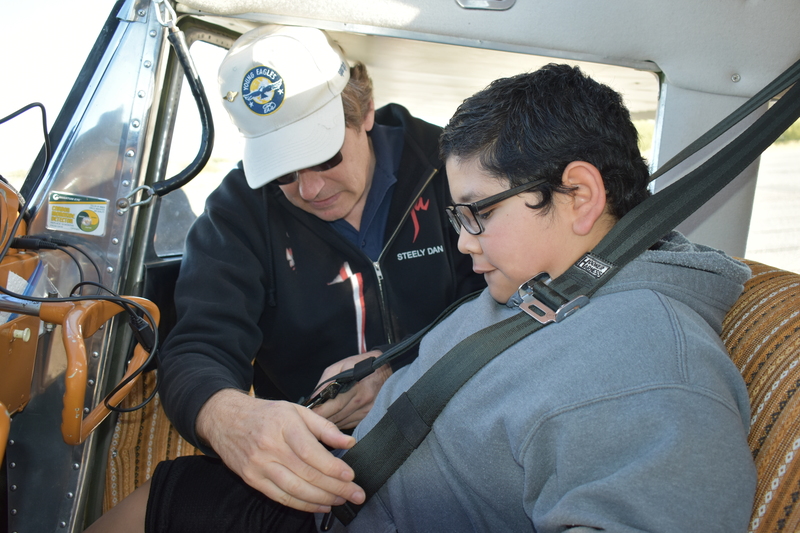 Pilot Wes Baker explains how to properly fasten the seat belt and shoulder harness to this Young Eagle before they depart. 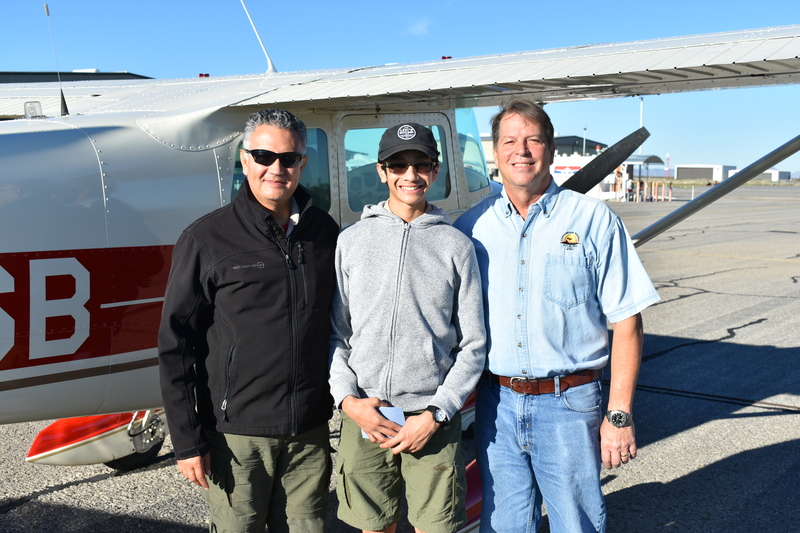 L to R: Pilot Tomas Peralta, with his Young Eagle and young man’s father, after completing their flight in this Red Arrow Flght Academy Cessna 182 Skylane. 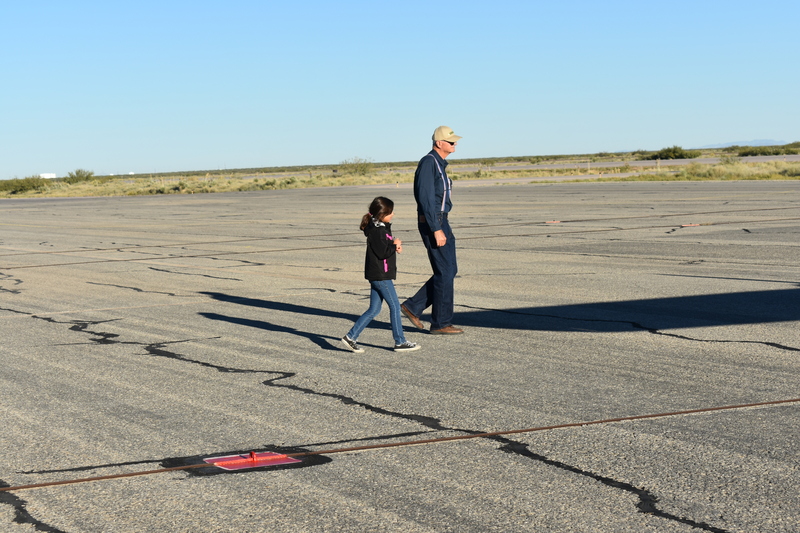 Dave Daniels walks back from his flight with this excited young lady, who has just completed her first Young Eagles airborne experience. 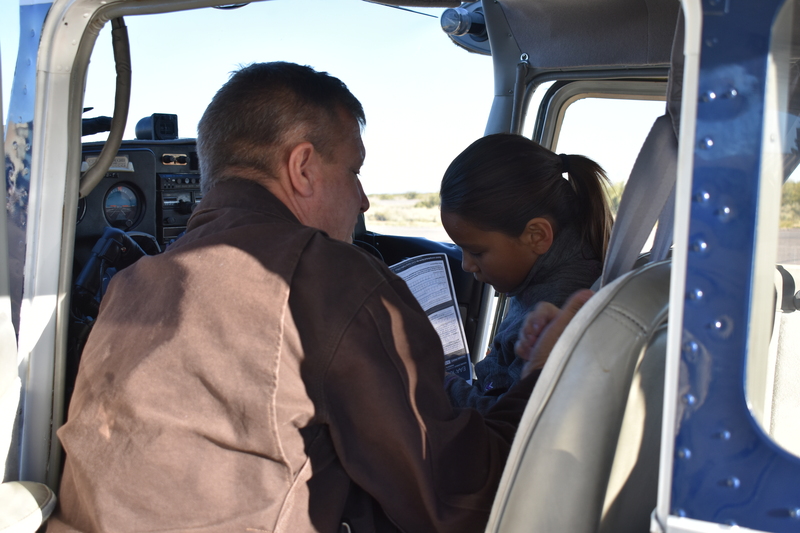 John Keithly fills out this happy young lady’s Young Eagle Flight Log Book, after her first experience aloft. A view of a somewhat inpatient group of Young Eagles awaiting their call-ups for their first flights. 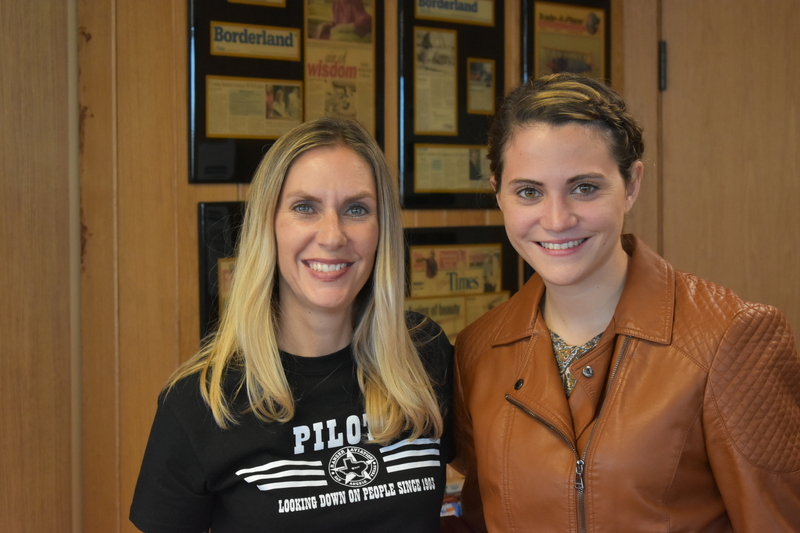 L to R: Airline Pilot and author of the new aviation novel, “Quantum,” Roxanne Lambie, poses by her book-signing table inside the WEAM Shop, with Ammber Valverde, AFROTC student at New Mexico State University, and Daedalian Flight Scholarship winner, who plans to become an Air Force Pilot. 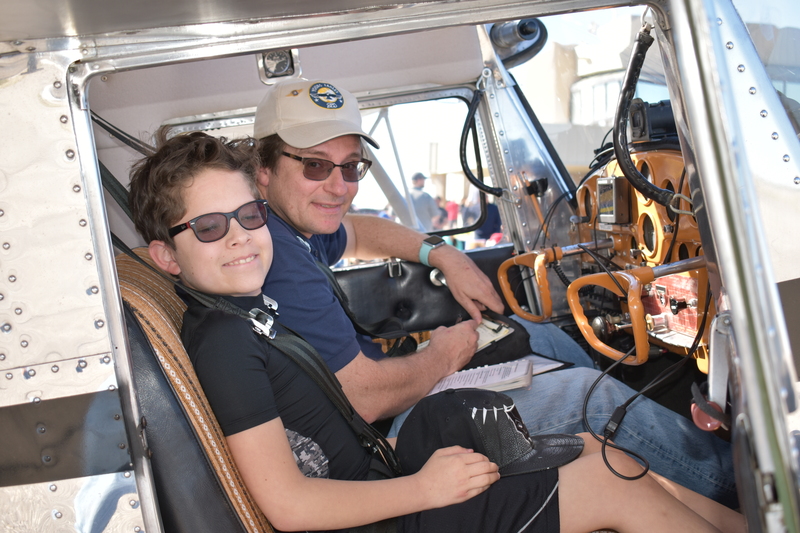 Another photo of Pilot, Danny Carter, taxiing out for takeoff with two Young Eagles aboard his Piper Commanche. 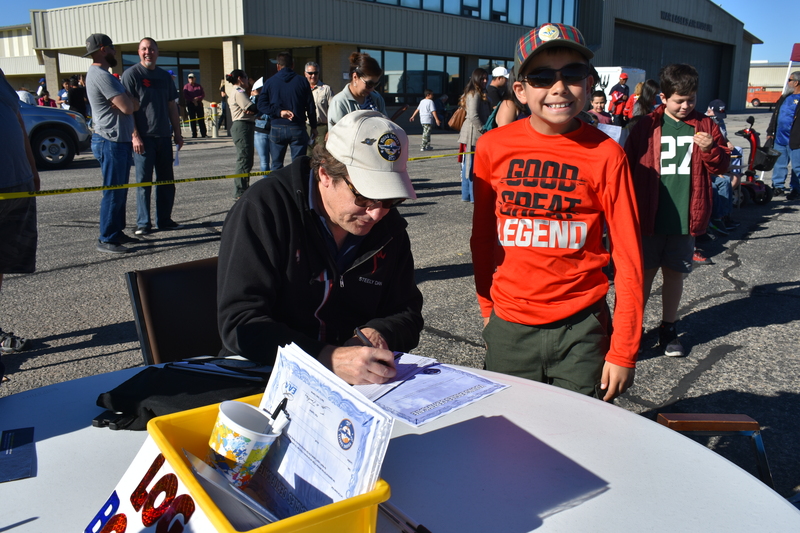 Pilot, Dave Daniels, fills out the Young Eagle Flight Certificate after completing a flight with this young man. 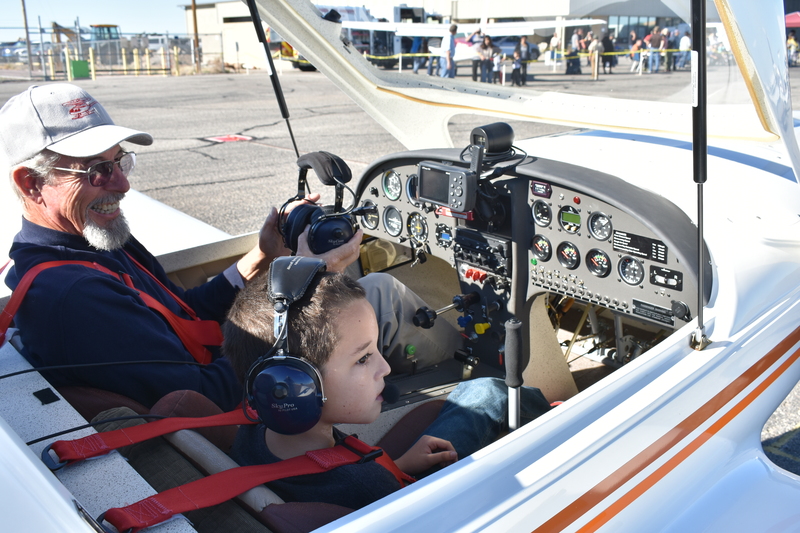 View through the Cessna 172 Skyhawk’s windshield of Pilot Mike Robinson and both his Young Eagle, in the Co-Pilot seat, and young fellow’s father in the rear. Dave Daniels poses with his next Young Eagle, who is adjusting his headset, as instructed by his host. Pilot John Keithly and his grinning co-pilot Young Eagle, as they ready to start the engine in this Czech Dynamic. 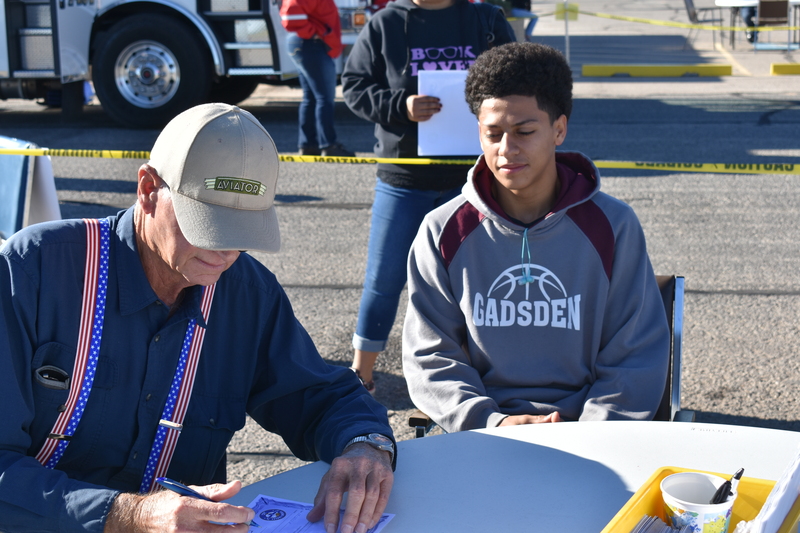 John Keithly fills out this same Young Eagle’s Flight Certificate. 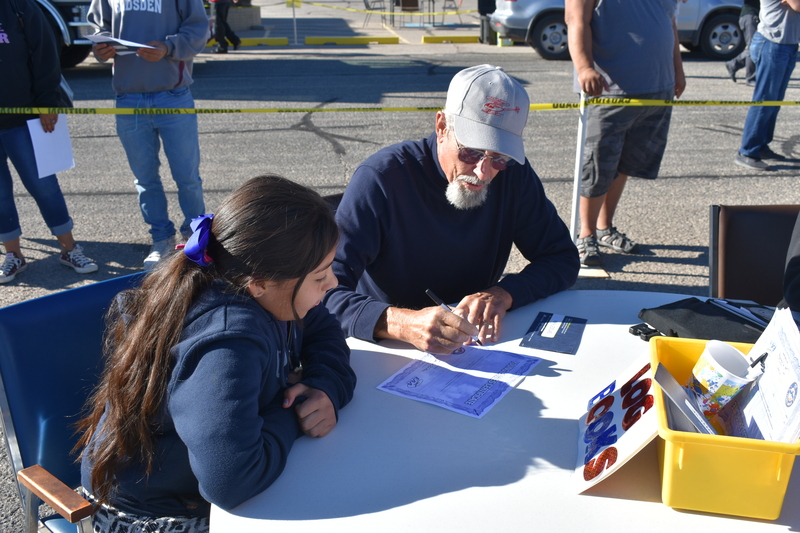 Pilot, Wes Baker, President of the Las Cruces, NM EAA Chapter 555, completes this happy Young Eagle’s Flight Log Book. 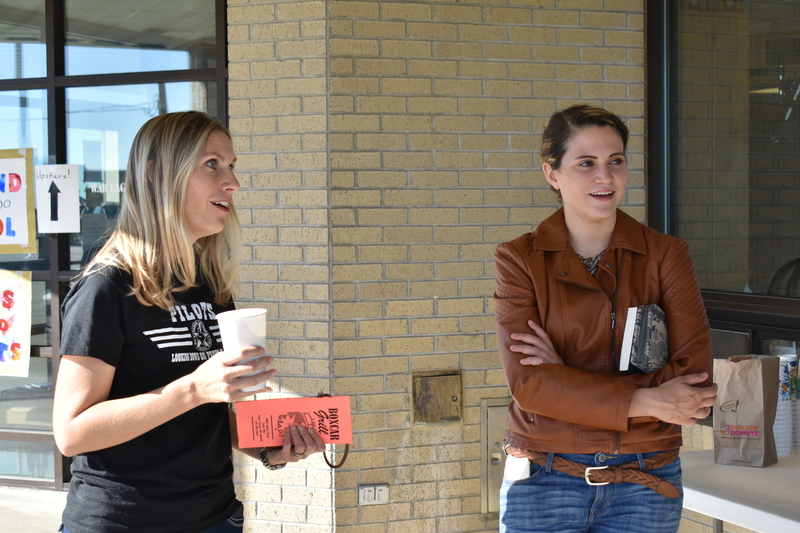 L to R: Roxanne Lambie, and Ammber Valverde, who has an autographed copy of Roxanne’s new novel under her arm, busily chatting with EAA members outside the War Eagles Air Museum main entrance. 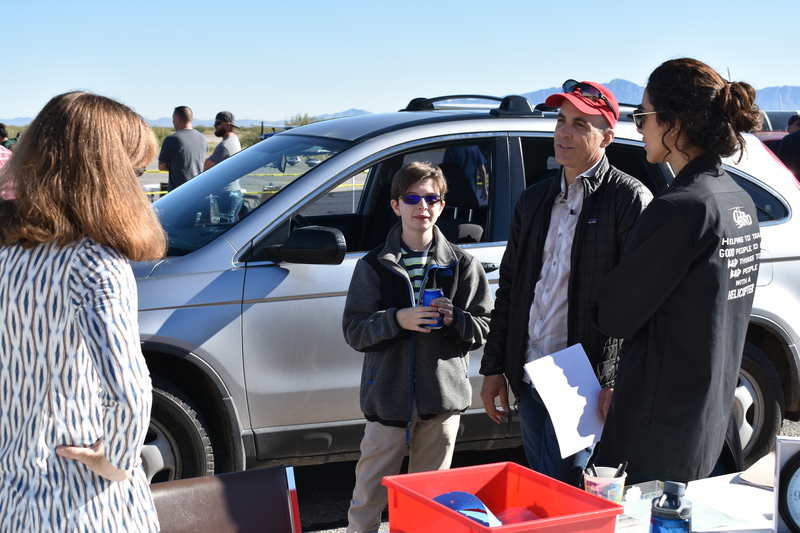 L to R: Melissa Keithly, a Young Eagle’s father, Prescilla Porras., and Wes Baker at Registration Sign-In table. 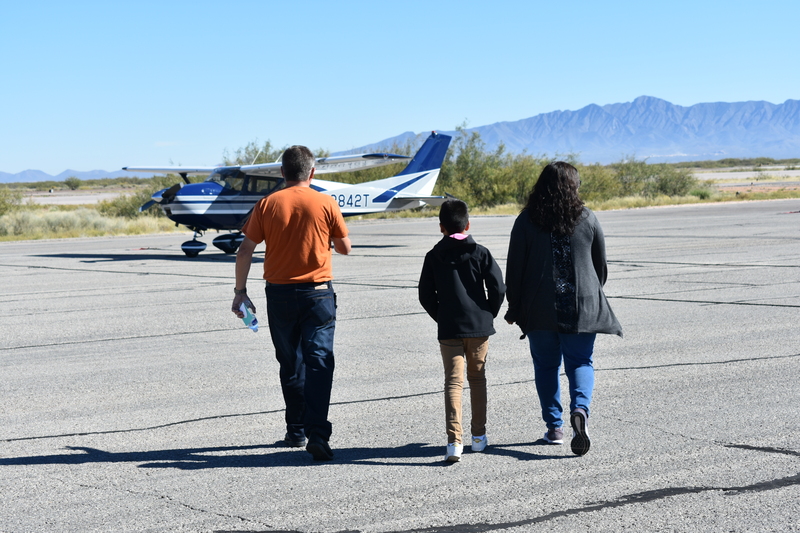 L to R above: Melissa Keithly, Young Eagle with his father and Priscilla Porras, helicopter pilot, discussing the event. John Keithly with another Young Eagle seated and ready to go, as young man’s father and brother watch. 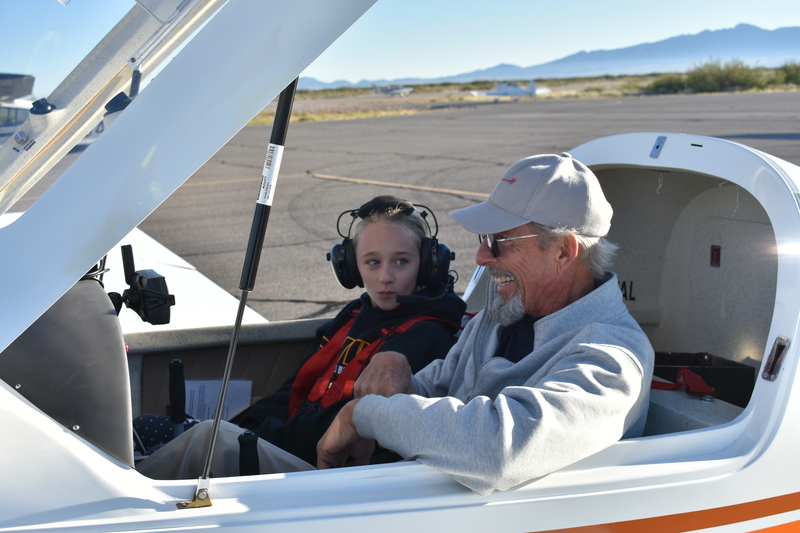 Pilot John Keithly gets ready to take this same intrigued Young Eagle aloft for his initiation flight in John’s Czech Dynamic Experimental Aircraft. 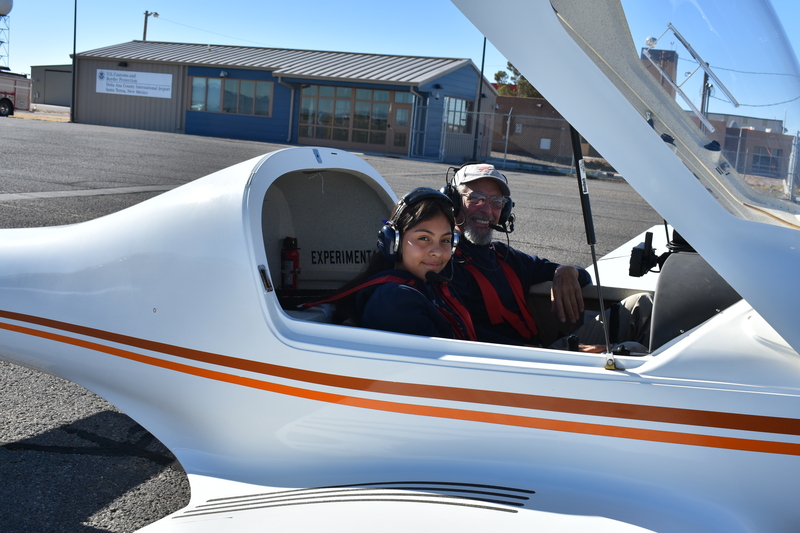 Mike Robinson gets ready to close the Cessna Skyhawk’s door in readiness for this young lady’s first Young Eagle Flight experience. 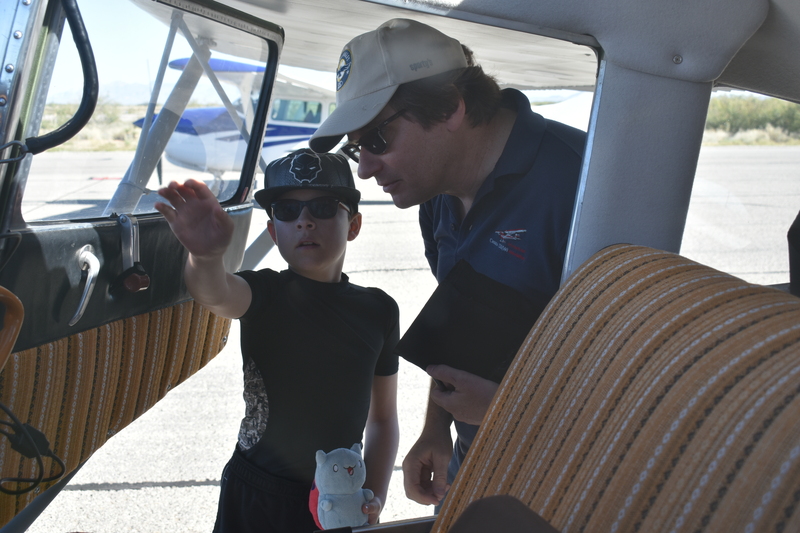 John Signorino explaining how the elevator and rudder controls work on this Cessna Skylane as his next Young Eagle and his mother take it all in . 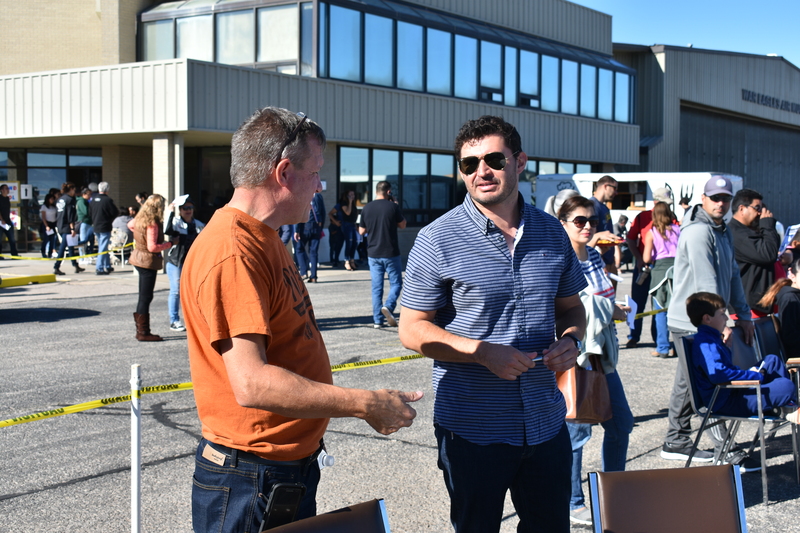 . .
During a short break, (L to R) Volunteer chapter Pilots, John Signorino and Tomas Peralta talk over the ongoing Young Eagle event. 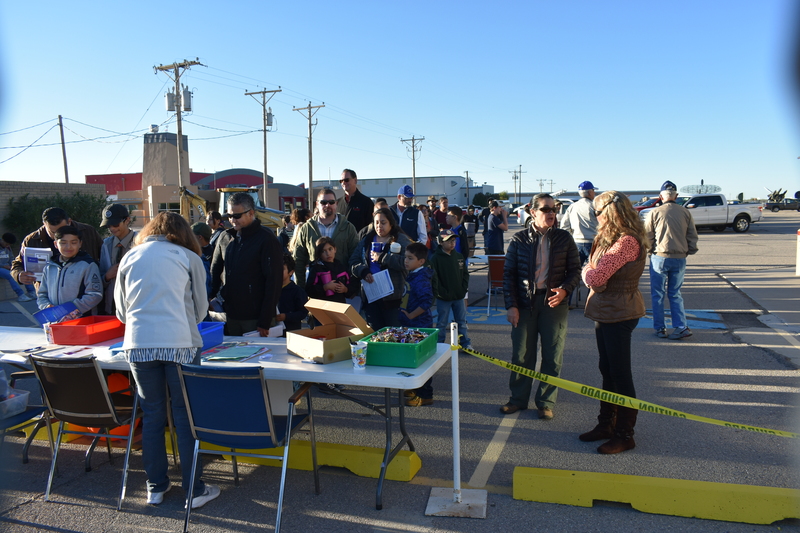 During the Young Eagle rally, many of the Young Eagles, their parents and visitors flocked in to view the great collection of airplanes, antique autos and motorcycles, and to also to buy souvenirs at the WEAM Gift Shop. 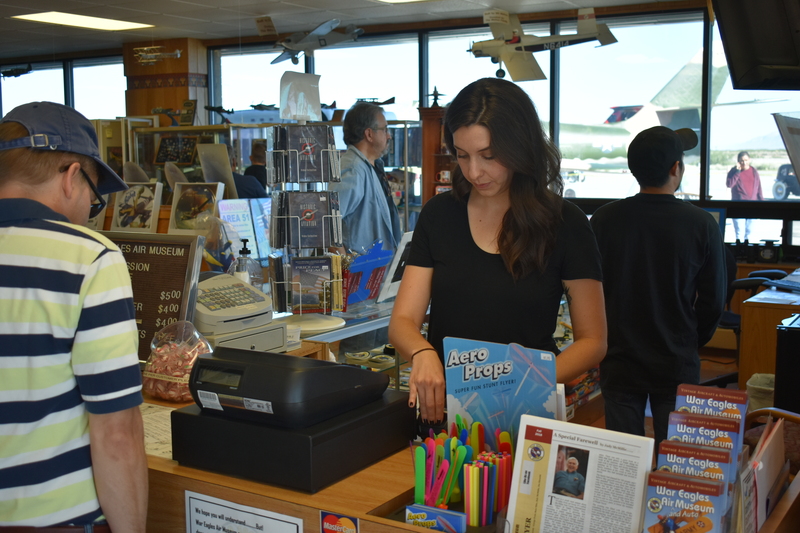 Making change at the cash register is Kathryn Guerra, whose father, George, the Museum’s Operations Manager, is standing behind her in the light blue shirt. 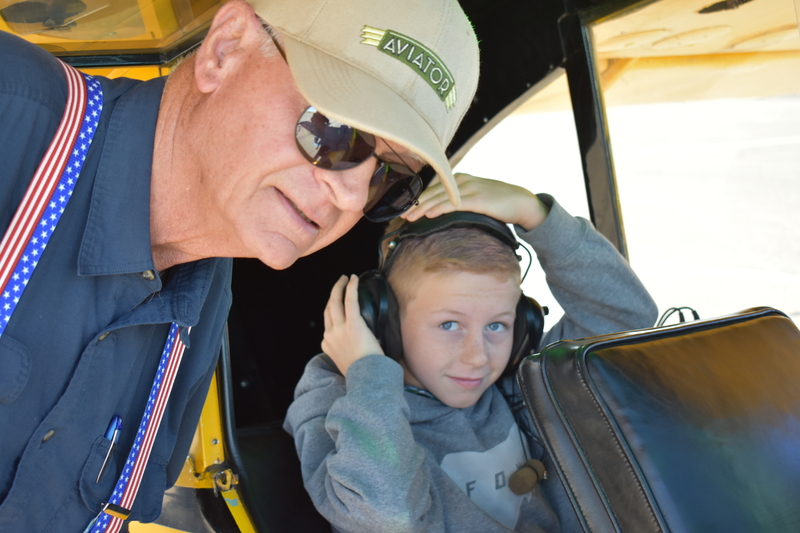 Pilot Wes Baker listening to his Young Eagle trying to see if he properly understood Wes’ explanation of how an airplane climbs. Piloting the helicopter back onto the tarmac, is Chapter Volunteer worker and chopper pilot, Priscilla Porras. 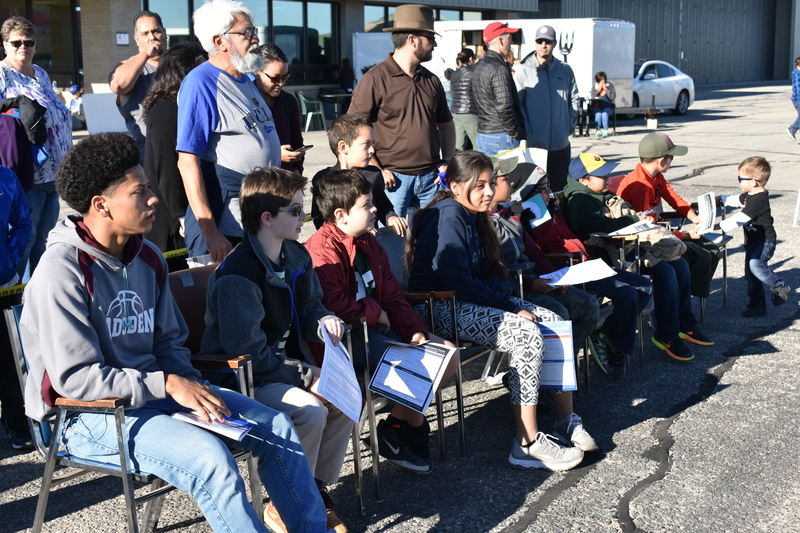 The same model helicopter, owned by Chapter member Mike McNamee, gave some 17 Young Eagles their first helicopter ride during the project. 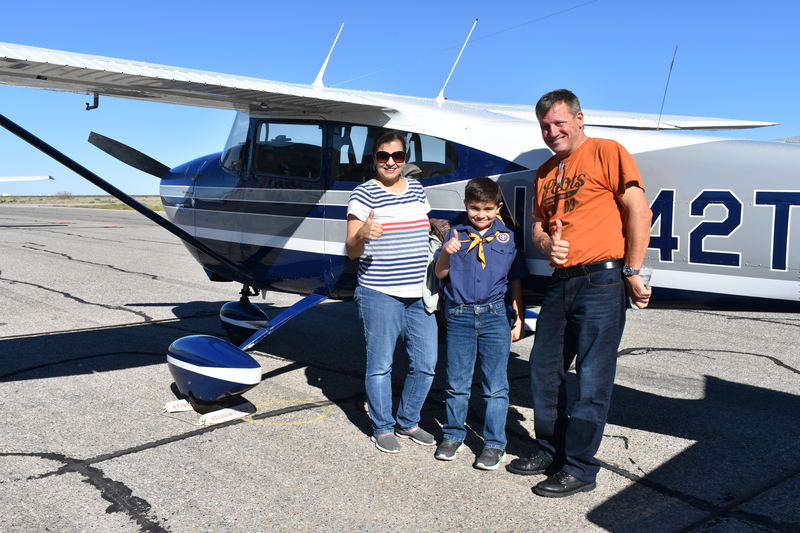 After an exciting first ride with both the Young Eagle, who’s also a Cub Scout, and his mother, Pilot John Signorino poses alongside the Cessna 182 Skylane with the happy pair. 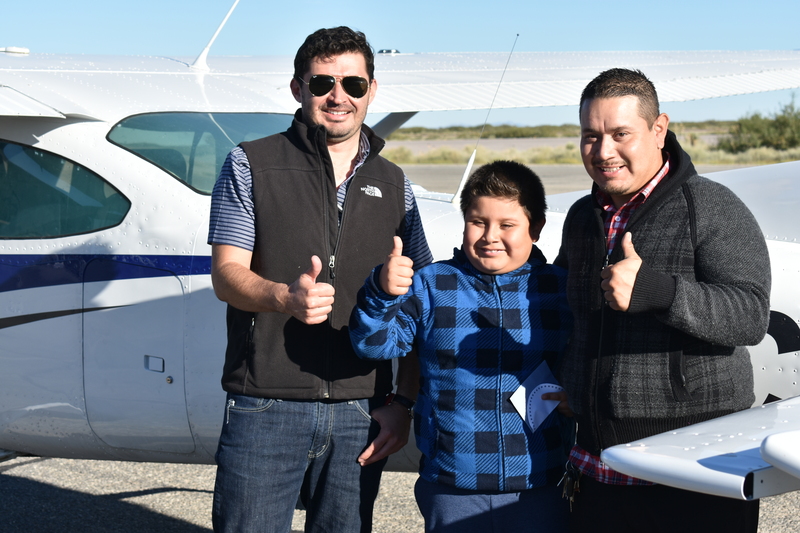 After completing a flight, Pilot Tomas Peralta gets ready to make out a Young Eagle Flight Certificate for this young man and his mother. 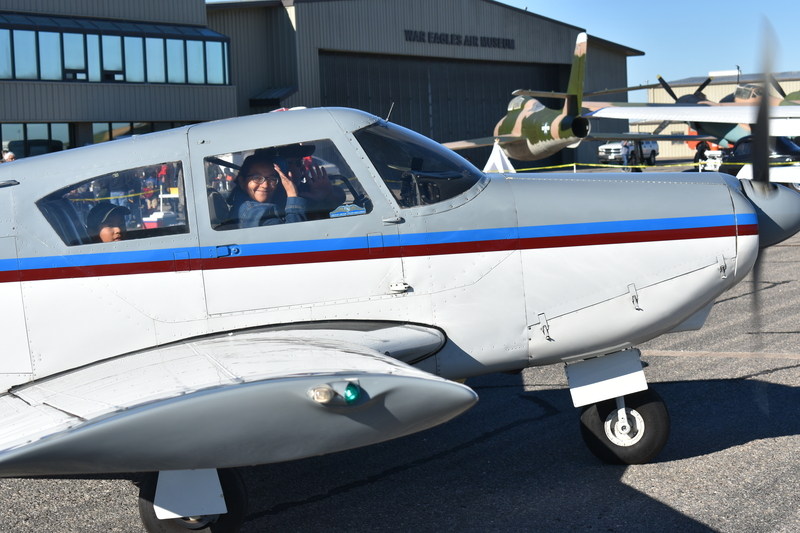 EAA Chapter 555 President, Wes Baker, an Air Force Academy graduate, gets ready to take this Young Eagle into the sky in his vintage Cessna 140. 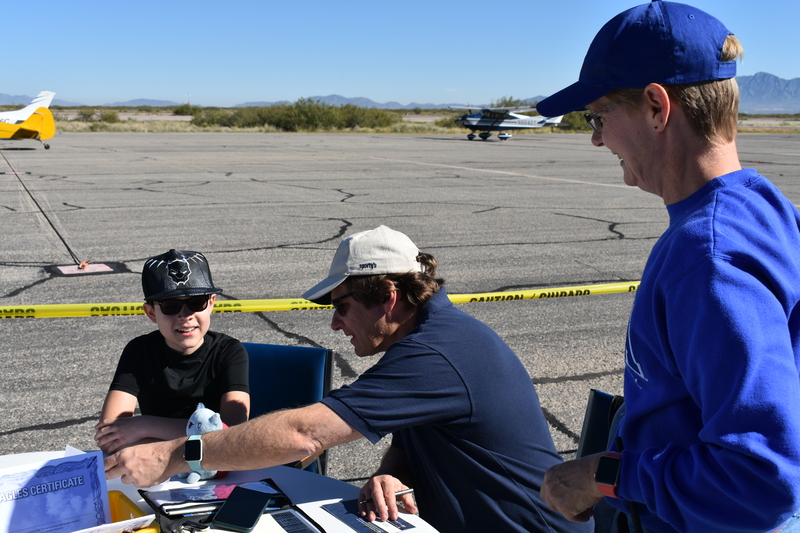 After the successful flight, Wes completes this Young Eagle’s paperwork, as Wes’ wife, Carol, looks on. 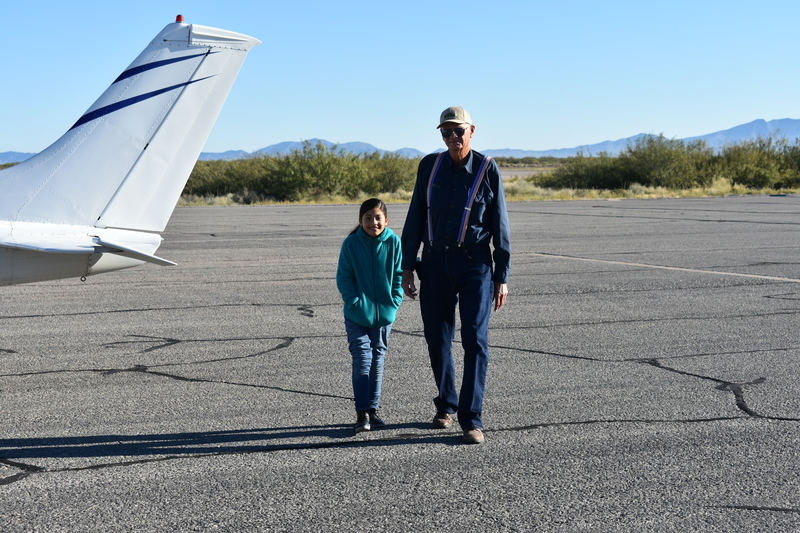 Volunteer Pilot, John Signorino, walks out to the McNamee Cessna 182 Skylane with his next Young Eagle, whose mother also took the flight. 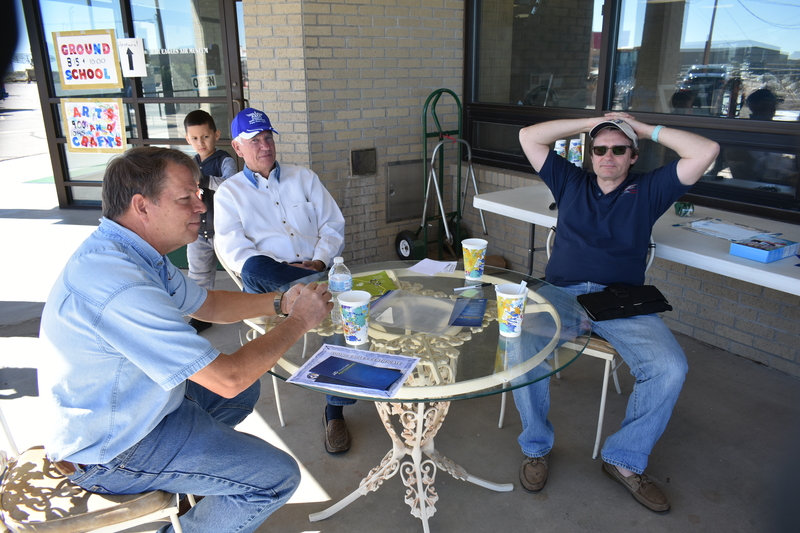 During another much-deserved break from the busy flight schedule, Pilot Mike Robinson (L) sits down to chat with fellow volunteer pilot, Wes Baker, on the Right. Almost the end of the busy day of over 60 flights, the volunteer pilots were caught discussing the event. 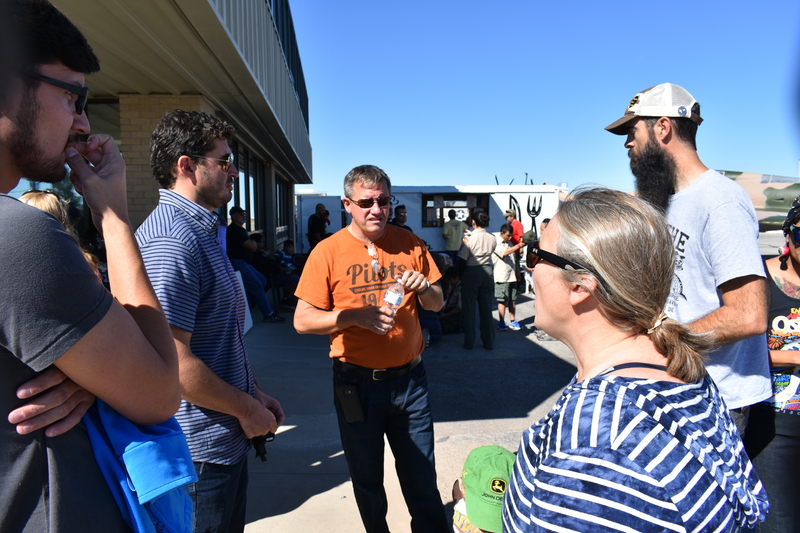 L to R: Dominic Austen (Pilot who conducted the Preflight Program), Tomas Peralta, John Signorino, Deb Rothchild, and Bryce Daniels. 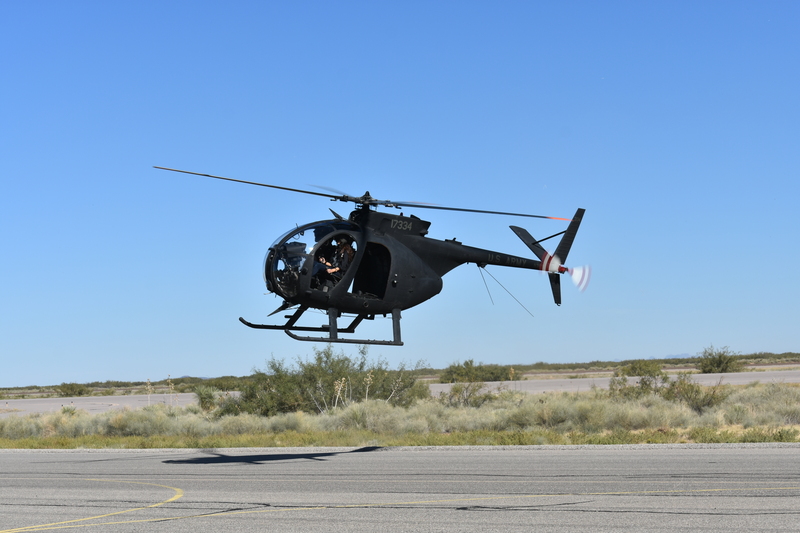 This entry was posted in AVIATION NEWS, HOT NEWS! 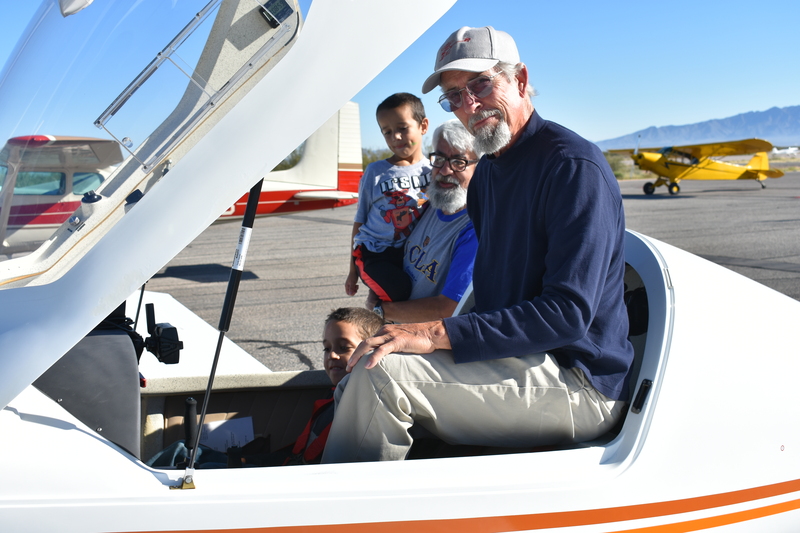 and tagged Ammber Valverde, Bob Dockendorf, Bryce Daniels, Carol Baker, Cessna 172, Cessna 182, Cub Scouts, Danny Carter, Dave Daniels, Deb Rothchild, Dona Ana County Jetport, EAA, EAA Chapter 1570, EAA Chapter 555 of Las Cruces NM, George Guerra, Jim Foster, John Keithly, John Signorino, Marcia McNamee, Melissa Keithly, Mike McNamee, Mike Robinson, Piper Comanche, Piper Super Cub, Priscilla Porras, Ric Lambart, Tomas Peralta, Volunteer Pilots, War Eagles Museum, WEAM, Wes Baker, Young Eagles on November 3, 2018 by FASFRIC.